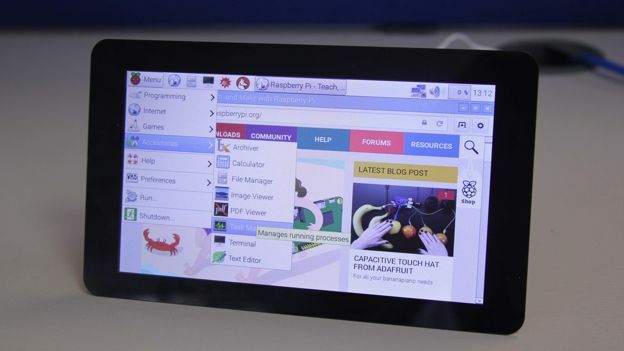 The Raspberry Pi has just become that little bit more useful following the addition of an affordable touchscreen to the micro PC's array of options. The 7-inch screen comes in at just £48 and turns the credit-card sized computer into a tablet PC or even an enlarged touchscreen controller for your home entertainment centre. As could be expected, the quality of the screen is at a rather low 800 x 400 pixels, which is never going to bother the iPads or other higher-end tablets of the world. It is a good enough level for anyone tinkering around with a Raspberry Pi though. In addition to the screen resolution it offers 10-finger capacitive touch and connects to the Raspberry Pi using the DSI connector, which leaves the HDMI port to be connected to another display and thus gives you the option to use the touchscreen as an interactive remote control. The Raspberry Pi fits snugly into a mount on the rear of the screen and both devices can be powered using a single USB source or an external one if that's preferred. Initial setup is incredibly easy as the kit comes with all the cables, jumper wires and screws required to fix it up to the Raspberry Pi, meaning you will be ready to use the touchscreen within minutes. There's even a range of different coloured frames that allow you to add a bit of individuality to the screen. The Raspberry Pi Foundation gives plenty of tips on its blog on how to set up the touch screen that includes tips about a suitable OS. The only thing it is sorely lacking is a stand, however a 3D printed version has been developed by Matt Timmons-Brown and modders are encouraged to give it a go themselves.